With so many startups concentrated in Manhattan, it's refreshing to see a unicorn like Etsy stake a claim on Dumbo. Etsy is now partnering with the neighbors in its beloved 'hood to bring a whole day of unique, only-in-Brooklyn fun activities. 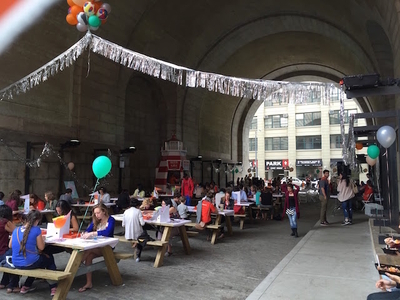 Stop by Etsy's HQ at Creative Chaos on Jay Street for some face painting. There will be organic vegan mini facials and massages at West Elm, DIY crafting workshop at Trunk, a blow-up castle at Recess d.u.m.b.o. (! ), and so many more fun events at businesses and galleries. Free with RSVP.